Question: On your website [under Lineage], you say that “Jiva Gosvami’s uncles, Rupa and Sanatana Gosvami received diksha from Gadadhara Pandita and Jiva Gosvami followed in the line of his uncles.” I do not see that anywhere in our Vaishnava literature. Is that in Chaitanya Charitamrta? Kindly assist me to know the correct answer as based on our shastra. Answer: I do not have any clear evidence from shastra on this. What I have written on the website is what I have heard from my Gurudeva, who is part of Gadadhara parivara (family) and has himself heard it in parampara. I trust his words and have no reason to think otherwise. Obviously it is not binding on others to have the same belief. Others will demand an evidence. Frankly speaking, I do not have any unambiguous, explicit evidence which will convince one without a doubt. It is my personal conviction and I am not trying or expecting others to agree with me. But since I have put it on my website on the authority of my Gurudeva and a question is raised on it, I am obliged to give some explanation. I will begin with an example. We Gaudiya Vaishnavas believe, have faith and trust that Caitanya Mahaprabhu is Krishna. But if a non-Gaudiya asks for evidence, it may not appear very convincing for them. At least I am not aware of any such evidence. Obviously it would have to be acceptable to a non-Gaudiya, which means not the words of the followers of Mahaprabhu, but some shastra acceptable to both Gaudiyas as well as non-Gaudiyas, such as the Puranas. Evidences such as the Krsna-varnam verse (SB 11.5.32) are not very explicit, and have alternative interpretations by other scholars, including Sridhara Svami who is accepted as an authority even by Mahaprabhu Himself. The question about the guru of Sri Rupa and Sanatana Gosvami is similar, albeit within the Gaudiya community. Nonetheless I am giving some evidences which you may or may not accept. One possible evidence is Sri Gadadharastaka in which the last line of each of the eight slokas reads – bhajami aham gadadharam supanditam gurum prabhum (I worship my guru and master Sri Gadadhara, who is greatly learned). According to my Gurudeva it is composed by Sri Rupa Gosvami. Sri Gadadharastaka is included on pages 49-51 in a book called Sri-stava kalpa-drumah (collection of verses, stotras, etc. 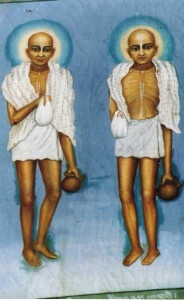 ), compiled by Sri Bhakti-saranga Gosvami and Sri Purusottama Dasa, both disciples of Sri Bhaktisiddhanta Saraswati Maharaja. However, there the author’s name is mentioned as Sva-rupa Gosvami and not as Rupa Gosvami. I have no idea who Sva-rupa Gosvami is. As stated above, my Gurudeva believes it is Rupa Gosvami. Later on, in the same chapter, he writes that both Rupa Gosvami and Sri Sanatana Gosvami appointed devotees belonging to Gadadhara family as servitors of their respective temples as per the wish of Mahaprabhu. He further writes that Sri Rupa offered the service of Govindadeva to Haridasa Gosvami knowing him to be the svarupa of Sri Gadadhara. My Gurudeva’s comment on this is that Sri Rupa Gosvami did not appoint Sri Jiva Gosvami as the in-charge of Govindaji temple. Sri Jiva was definitely qualified and also belonged to the Gadadhara parivara, being the only initiated disciple of Rupa Gosvami. However, because the latter was his nephew, he appointed another person of the Gadadhara parivara, so that nobody could presume that Sri Rupa was favoring his blood relative. Sri Sanatana Gosvami did the same. He could have appointed Sri Jiva Gosvami or his own son Sri Rajendra who also lived in Vraja and is mentioned in Caitanya Caritamrita. Sri Sanatana Gosvami rather appointed Krsnadasa Brahmacari who also belonged to Gadadhara family. 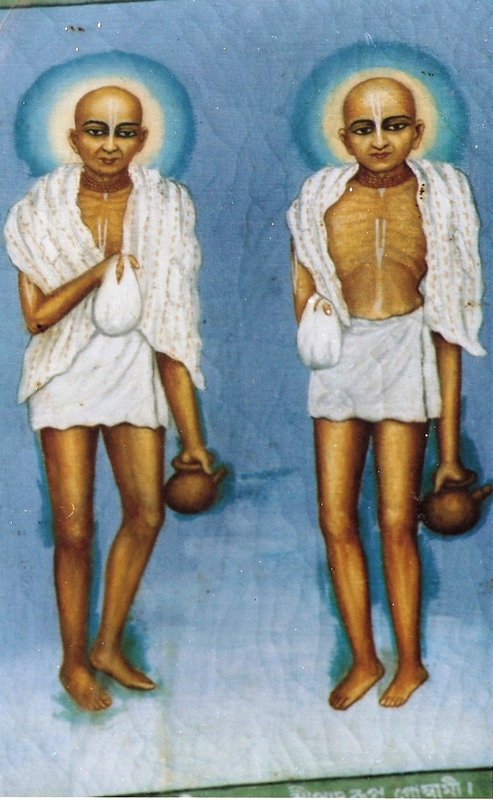 Both Haridasa and Krsnadasa are mentioned in Caitanya Caritamrita as part of the Gadadhara branch. According to Sadhana-dipika, all the three main temples of Vrindavan, i.e. Govindaji, Madana-mohana and Gopinatha were served and managed by the followers of Sri Gadadhara. There is also mention by Narottama Dasa in Prarthana, Song 10, that he also belongs to Gadadhara parivara. Before Mahaprabhu sent Rupa and Sanatana Gosvami to Vrindavan, He had sent Sri Bhugarbha Gosvami and Sri Lokanatha Gosvami there. Bhugarbha Gosvami is mentioned in Caitanya Caritamrita as part of the Gadadhara branch. Lokanatha Gosvami is supposed to be the nephew of Bhugarbha Gosvami and in all probability was also a follower of Gadadhara Pandita. 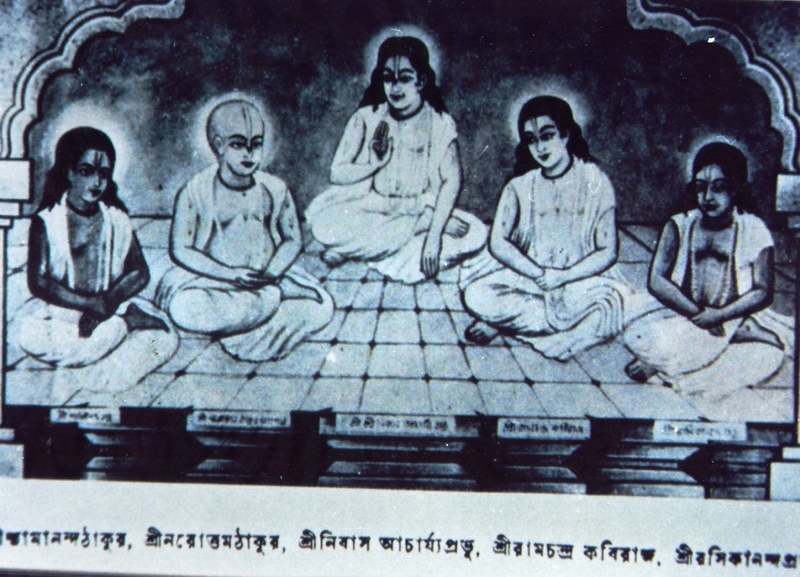 Gadadhara Pandita reciting Bhagavata to Mahaprabhu, Nityananda Prabhu and others. This seems to be confirmed by Narottama Dasa Thakura’s song stated above (Gadadhara mora kula – Gadadhara is my family), since Narottama was a disciple of Lokanatha Gosvami as stated in Bhakti Ratnakara, Ch. 1, verse 346 and is also understood from the song sri guru carana padama. From Caitanya Caritamrita and Caitanya Bhagavata, it is understood that Mahaprabhu gave vigraha seva, service to the deity and also the Tota Gopinatha deity Himself, to Gadadhara Pandita. He was also given the service to recite Bhagavata Purana. 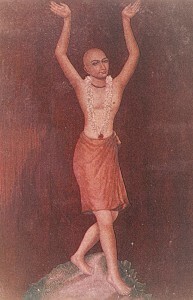 Mahaprabhu personally used to listen to it from his mouth at the bank of Narendra Sarovara in Puri. According to the author of Sadhana-dipika it means that He authorized specifically Gadadhara Pandita to propagate vigraha seva and the teaching of Bhagavata. This implies that Mahaprabhu also authorized Gadadhara Pandita to initiate because deity worship cannot be performed without mantra diksha. Therefore, it is not surprising that the deity worship in Vrindavan was performed by the followers of Gadadhara Pandita. In Sadhanadipaika (Chapter 7, page 143), it is written that in Puri, Navadvipa and in Vrindavan the service to the deities and recitation of Bhagavata Purana is done by the followers of Gadadhara Pandita, who is the main representative of the internal potency of Mahaprabhu. This was according to the desire of Mahaprabhu. This point is reiterated in other parts of this book with references to Caitanya Caritamrita and Caitanya Bhagavata. In Antya Lila, Chapter Seven, there is also the story of Vallabha Bhatta visting Mahaprabhu. In verse 171 it is mentioned that Vallabha Bhatta took mantra diksha from Gadadhara Pandita. This also indicatives that Mahaprabhu wanted Pandita Gadadhara to accept disciples on His behalf. It also agrees with the idea that Mahaprabhu came to give Radha-bhava as Gadadhara is a manifestation of Radha. From all these evidences it is clear that Mahaprabhu wished Sri Gadadhara Pandita who is Radha herself, to initiate on His behalf and propagate deity worship and teachings of Bhagavata Purana through his disciples. Of course, to this one may object that I am biased because I belong to Sri Gadadhara’s family myself and am trying to include the Gosvamis as part of my own parivara. In any case, this is my personal view and I am not trying to convince anyone. Personally it does not matter to me what others have faith in, because whether Sri Rupa-Sanatana are disciples of Sri Gadadhara Pandita or someone else does not diminish their greatness, nor does it change our philosophy. As long as we agree on the siddhanata there is no problem, even if our beliefs about historical facts are different. Question: Even though Narottam sings ‘gadadhara mora kula’ [Gadadhara is my family], this could be a metaphor only or glorification in poetry. Otherwise ‘pati mora Gauracandra’ (husband of Gauracandra) in the same song means Narottama is a nagari or gay or so? Answer: The word pati does not always mean husband. It means protector, master or Lord, as in the words jagatpati (Lord of the universe), satvatpati (master of the Satvatas) used for Krishna. So the above song can be taken metaphorically or it can also convey some facts. 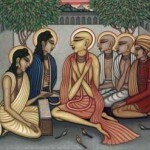 Question: In Bhakti Ratnakara (1.598-602) it is mentioned that Vidyavachaspati was the religious teacher of Sri Sanatana Gosvami – bhaTTAcAryaM sArvabhaumaM vidyA vAcaspatin gurun. Sanatana respectfully mentioned the name of his guru in his book Sri Dasama Tippani. Therefore it seems that he received diksa from Vidyavacaspati and not from Sri Gadadhara Pandit. Answer: The word guru means any respectable person, it could be a teacher or family member. It does not always mean diksha guru. We have to understand the meaning of a word in the cultural context. At present, in spiritual societies the word guru seems to have only one meaning, i.e. one who gives initiation. But if you refer to any Sanskrit dictionary, you will see so many other meanings of this word. In Sanskrit literature, the word guru is not understood only in the sense it is understood at present. In fact, the word guru may be hardly used in the sense it is understood now. The closest you will find is one who does the upanayana samskara, the sacred thread ceremony which was performed for males at the young age of 8-11 years. One has to be knowledgeable how the words are used by the author. Therefore one needs to study in the tradition, know the cultural background. Words change meaning over a period of time. We have to keep that in mind. 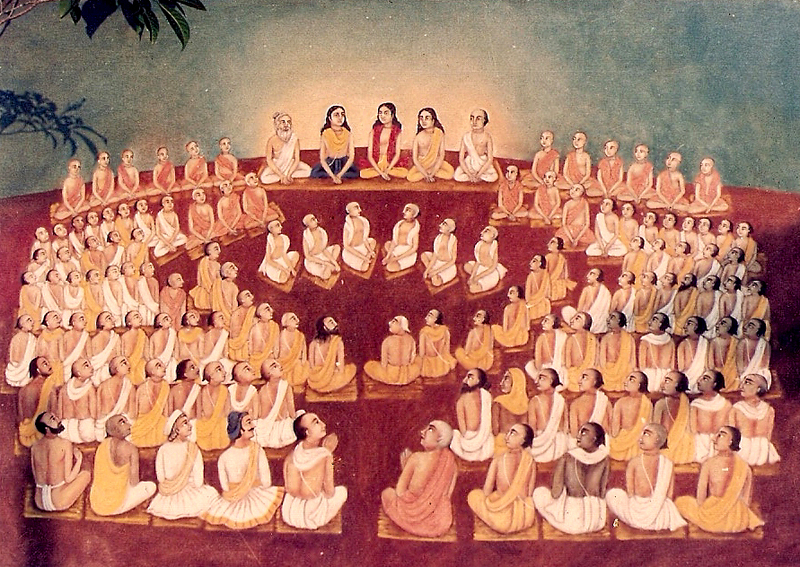 Sanatana Gosvami studied under Vidya Vacaspati. It does not necessarily mean that he took diksha from him. In fact, the above translation says “religious teacher”. 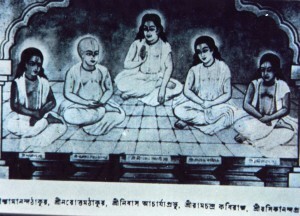 He studied before he met Mahaprabhu. It is assumed that after he became a follower of Mahaprabhu, he accepted vaisnava diksha from someone. It is a well-known fact that of the Pancha-tattva, only Gadadhara Pandita stayed with Mahaprabhu in Puri. Nityanada Prabhu and Advaita Acharya were not living in Puri. So it is quite probable that Sri Sanatana and Sri Rupa got diksha from Gadadhara Pandita. 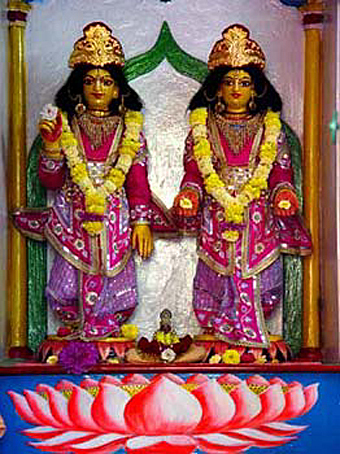 Gadadhara Pandita is supposed to be Srimati Radha. Mahaprabhu is supposed to have appeared to give Radha Bhava. Then it makes sense that he asked Sri Rupa and Sanatana to take mantra from Sri Gadadhara Pandita, since these two were the main proponents of his siddhanata. Question: In the invocation to Laghu Bhagavatamrita (1.5) it says, “Of Sri Brhad-bhagavatamrtam, manifested by the lotus words of my master, this book is a summary.” So from this I would assume that Rupa Gosvami was a disciple of Sanatana Gosvami. Answer: The Sanskrit word used is mat-prabhupada – my master. This does not mean that Sanatana is his diksha guru. It is an honorific title. In the devotee community it is very popular to call each other prabhu. There is no difference between the word prabhu and prabhupada, although people think so. By adding pada after prabhu, it becomes more respectful, but the meaning is the same. 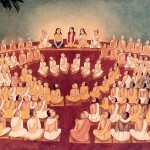 Question: Bhakti Rasamrita Sindhu, Rupa Gosvami also states that Sanatan Goswami and not Gadadhara is his Guru – visrAma mandiratayA tasya sanAtana tanor mad Ishasya. Jiva Goswami comments on this: atha nija nijeSTa-devAvatArena nija guruM stavan prArthayate. Answer: The verse does not use the word guru at all. The commentator, Sri Jiva Gosvami, does say that the author prays to his guru. The word guru could mean initiating guru, or teacher or just elder brother. If one wants to take it to mean initiating guru, it is fine with me, but that is not how I take it. The problem is, as I have said elsewhere, that in the past it was not a custom to reveal the name of the guru freely. I gave the example of my own Gurudeva. 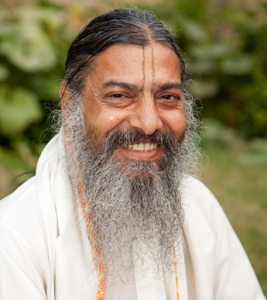 He has printed more than 80 books, and whatever books I have read – and I have read most of them – I have not seen his guru’s name mentioned even once. I have never heard him say his guru’s name except on some very special occasions. Therefore, it is difficult to know the guru’s name of traditional Vaishnavas from their writings. Not that they never mention it, but it is not very common. The other cause of confusion is the word guru itself, which has various meaning besides initiating person. I would like to learn more about the custom of not revealing the guru openly. Please explain in more detail. The basic custom in vedic culture is not to utter the name of a senior person, such as one’s elder brother, mother, father, uncle, husband, teacher etc. Seniority is by age, and by relation. Sometimes an uncle may be junior by age, yet he is senior by relation. The word for senior is guru. According to niti-sastra one should also not utter one’s own name, one’s wife’s name. There is a sloka to this effect. I do not remember the exact words. This is one of the reasons that it was difficult to know much about the authors from their writings. This does not mean that it is absolutely forbidden. But as far as possible it should be avoided. If, however, there is need to utter their name then it must be done with respect i.e. by receding it with honorofics such as sri or srila. Therefore, in India still the custom is to call people by their family name, such as Sharmaji (ji is added for respect), Guptaji etc. Those who have lived in India must have noticed it. Among the sadhu community they use words such as Babaji, Swamiji, Gosvamiji, Prabhuji, Maharajji, Gurudeva, Prabhupada. Sometimes people live in an ashrama for years, never knowing the name of the ashrama chief because everybody addresses the chief by some title as mentioned above. Many times people think that Prabhupada is the name of the ISKCON founder or that this word is something special and cannot be used for anyone else. This is because the word has been used so exclusively. But anyone can call their guru or some senior devotee as Prabhupada. When Vallabha Bhatta met Sri Caitanya this is the argument he gave against chanting the name. How can we utter the name of God who is the most senior, pati of the universe. 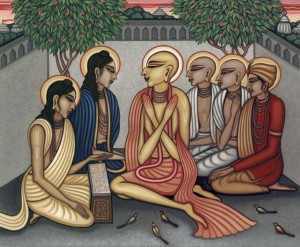 Mahaprabhu’s reply was that sastra ordains it. Thank you, that is very clear. I live in Japan, the custom you refer to has spread throughout Asia, and exists in Japan, too. In Japan, when we write our name, we put the family name first. When we speak to or about someone else we call them by some description other than their literal name if possible (Mr. Customer, Ms. Boss, Mr. Husband, Ms. Wife, Mr. Son, even Ms. Daughter, like that). If there is intimacy the name can be used, but usually the family name only. Even for children in school, the teachers tend to call my son by his last name. “Mr. DiCara.” If there is a great deal of intimacy, as there is in intense forms of sakhya, vatsalya, madhurya, then only can we use the first name. Still then usually with an honorific suffix (there is a less official version of the honorific). To use a first name alone with no honorific is an insult in almost every but the most extremely intimate cases. I have two followup questions for you, I hope you won’t mind answering. 1) In writing, I often see people addressed without extended honorifics. Writing is a record of speech, so what is your comment on this? 2) In ISKCON and related branches of the Gaudiya Matha it is not at all uncommon that upon first meeting someone they inquire who your guru is, or express who their guru is. I find this distrubing. I am not quite sure why it bothers me so much – maybe because I feel that the person represents his or her guru, so what is the need to ignore the person by inquiring about the guru directly. Do you have a comment or remark on this point? Dear Vraja, i am surprised that in Japan they have the same custom of not uttering the first name. They seem to be even more strict than Indians. I know that in Thailand they follow many Indian customs but was not aware of Japan doing that. About your questions: 1. Are you talking about traditional writings, such as Puranas, commentaries etc, or the writing in modern times? In the traditional writings the name may be mentioned without honorific due to different reasons. One could be that it may not match the meter since most writing is in verse form. Or it may be to save some paper and ink. But ususally there are honorifics. To give an example, whenever Sri Jiva Gosvami refers to Sridhara Swami he just writes Svamipada or Tikakara (the commentator) or he says iti taih – ” this is said by them “. Using plural for singular is one way of giving respect. While writing in English, we tend to not use honorifics. When i first wrote commentaries on Tattva Sandarbha, I was always putting Sri before Jiva Gosvami. My editor scolded me for this. Since then it became my habit to drop it. His logic was that Sri etc are fine in Sanskrit or in Indian languages but not in English. Maybe this is the opinion of others too and thus in writing the honorifics are not used so commonly. 2. I do not consider it very appropriate to immediately question one about one’s guru. I feel the same as you – uncomfortable. In India we find a great deal of warmth in the heart: rati, sneha, anuraga – and therefore there is less need for viddhis, because the Indian people tend to wind up doing the right thing anyway even when they ignore rules. In Japan the warm heart is very deeply buried, almost inaccessible. Japan is a cold place. Therefore viddhi is everything here. People embrace the viddhi as a surrogate for rati, sneha, etc. In surveying a variety of Asian culture, I suspect that at some ancient point Indian culture was very, very influential throughout Asia. But the people are colder and less spiritually alive, so the cultural focus becomes different, more like smarta and karma-mimamsa and sankhya, entirely, without other schools of thought. I always love speaking with you. Thank you for your replies! Rules are needed as a replacement for love and affection. Of course it does not mean that there are no rules in love. About no 1. i.e. names in sanskrit and Bengali books. One reason i gave was the meter. In poetry usually the honorifics are not used to maintain the proper meter. These books are not in prose. The second point i would like to mention is that many times these names are not personal names but like family name or titles such as Suta. Suta is not his personal name. His name was Ugrasrava. Suta is a family name. His father is also called Suta, Romaharsana Suta. Similarly Kaunteya, Partha etc are not Arjuna’s personal names. They could also mean Bhima or Yudhisthira. Same with Mahaprabhu. That itself is an honorific. Thank you. That makes good sense. More questions, (1) “Suka” – is that a proper name or an indirect moniker, like “Suta”? (2) Is “Goswami” an honorific, such that “Rupa Goswami” is a respectful address in itself? Thank you for the sloka from HBV. There are similar verses in Tantras. ‘Suka’ is the proper name of the son of Sri Vyasa. How do non-Gaudiyas translate the Krsna varnam verse (SB 11.5.32)? Here is Babaji’s reply: Non-Gaudiyas, including Sridhara Svami, apply this verse to Krsna. Krsna-varnam means He has blackish color. TvisAkrsnam is broken as tvisA+krsnam which means His bodily hue is blackish. Gaudiyas break it as tivsA+akrsnam which means that His bodily hue is not blackish and thus golden. The word can be broken in both ways. Some have broken it like us, i.e.tvisA+akrsnam and explain that although He is blackish in color (krsna-varnam) yet His bodily hue is not blackish but effulgent like a blue-sapphire. The anga refers to Krsna’s bodily parts such as His heart, upAnga to His Kaustubha gem etc., astra to Sudarshana, and parsada to Sunanada etc. In Kali Yuga, intelligent people woership Him by sankirtana. Needless to say that their explanation is more direct and convincing if you do not have an idea of Caitanya in your mind. No struggle to stretch the primary meaning of the words. But it leaves one doubt uncleared. How is it that Krsna is avatara for Dvapara as well as for Kali? Nobody has bothered to address this. But my guess is that they will answere that in Dvapara Krsna is avatara personally and in Kali it is His name. Krsna-varnam means that his complexion is black. TvisAkrsnam means… that his complexion is black??? That is the flaw of redundancy. Therefore it is an inferior interpretation. Krsna-varnam can mean “resounding ‘Krishna'” – but Krishna did not go around doing nama-sankirtan (“resounding Krishna”), Mahaprabhu Sri Caitanya did. Therefore interpreting Krsna-varnam tvisAkrsnam as “Krishna, without the black color, who resounds “Krishna”” is the most direct interpretation, in my humble opinion. Does anything need to be corrected here? Just a minor comment. While referring to Non-Gaudiya commentators, You have translated both krsna-varnam and tvisakrsnam as black in complexion. But they translate first as black in color and second as black in complexion. May be complexion is not the right word for tvisa. The intent of the commentators is that although krsna is black yet his skin is shiny. He is not jet-black, but glossy black. Thus it is not a case of redundancy. Maybe tvisa is best expressed as “luster”? So they are saying “his color is black, but his luster is bright.”? That is nice. thank you.